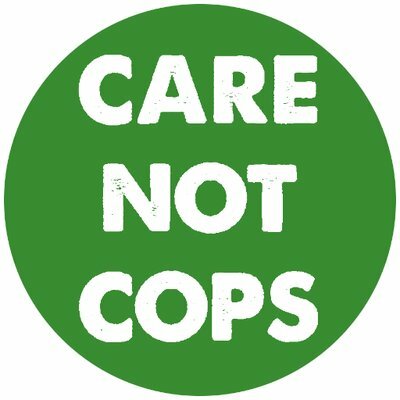 Care Not Cops (CNC) and its anchor organization Critical Resistance Portland (CRPDX) launched a new campaign targeting the Portland Police Department’s Gang Enforcement Team (GET). This revitalized Care Not Cops campaign deviates from what CNC focused its campaign lens on in 2018 as it tackled the Portland Police Department’s budget request of over $12 million dollars (increased from a budget of 2.1 million the year before) for the Gang Enforcement Task Force. During the 2018 campaign, CNC focused on issues of police violence through a mental health care lens. CNC and CRPDX stated January 13, 2019, that a lens focused on the inadequacy of Portland police officer’s ability to respond to mental health crises limited the ways in which CNC and CRPDX (who are both prison abolitionist organizations) could express and tackle the fundamental issues of policing. “Mass imprisonment generates profits as it devours social wealth, and thus it tends to reproduce the very conditions that lead people to prison”. Cory Lira, one of the founding members of the Critical Resistant Portland chapter sees that “what makes us complacent in seeing the PIC as logical is often not knowing alternatives”. CNC says they are altering their lens of focus because their original campaign forced conversations of anti-blackness into a mental healthcare frame, and they observed the centering of white neuro-divergence in conversation rather than the system of oppression which the PIC functions. They made it clear that the focus of mental health is not gone from the campaign, but rather it is not the lense through which Care Not Cops will address police violence and institutions that depend on police power. CNC concluded that the current political landscape of Portland, as well as the greater country made launching this campaign both crucial and timely. The main focus of this campaign as discussed earlier is Portland’s Gang Enforcement Team and the use of racial profiling in the whole of the PPD. A 2016 and 2017 audit of The Gang Enforcement Team by the city auditor found a lack of substantial data to prove GET’s effectiveness. The report cited that the tactics used by GET were disproportionately aimed at Black Portlanders. Out of the 1,300 reported encounters, only 800 were classified as actual traffic stops – while the other 500 were labeled as “mere conversations”. When police classify stops as “mere conversations” they are not mandated to record the data from these stops. Out of the 800 traffic stops in 2016, 59 percent of them were black drivers. Often being pulled over for the appearance of their car, the location, or just the driver’s behavior. Since the early 1990’s the GET compiled a “gang affiliation list” which contained 356 names when it was disbanded in 2017. Each individual on this list was ranked, and the list contained a top 30 category. CNC states that this list is still being actively used, and now that it is not a matter of record, there is no appeal or notification process for individuals put onto the list. Last year CNC was able to cut the Portland Police Budget from roughly 12 million to roughly 6 million. Following this success, the coalition believes that with more structure and community engagement they will be able to reduce the PPD’s budget significantly, and put pressure on city officials to publicly oppose the Gang Enforcement Team and future PPD budget increases. Currently, CNC is putting together a report which compiles a list of resources which would benefit from the reduction of the PPD’s annual budget directed by community groups and leaders. This list will be released on February 6th. Representatives stated that the Care Not Cops campaign is a community effort. They called on organizations to be a part of the campaign. The campaign launch was attended by individuals and groups representing 14 organizations, ranging from the Portland Parent Union, The Oregon Health Equity Program, Mental Health Providers Unite!, Liberation Literacy, Don’t Shoot Portland and more.